I expected Red Bull to bring some significant changes to the car but I have been proved wrong so far. Instead the Milton-Keynes based team brought a few small things that should help manage the airflow around the car. We will start with their revised DRD (about DRD – https://thewptformula.wordpress.com/2013/02/12/analysis-the-drag-reduction-device/). Red Bull brought their first incarnation of the system to the YDT (Young Driver’s Test) in Abu Dhabi and it appeared briefly on Day 2. They have made the stalling shaft span right up to the underside of the rear wing but not quite touching and it is much narrower than the Mercedes, Lotus or Sauber systems. What we cannot see is where the exit hole is for the airflow that passes through the inlets of the system when it is not stalling the rear wing, nor the inlets (or ears) that provide the airflow for the device. My guess is that the inlets are housed within the airbox and that the exit duct is beneath the rear crash structure but I have not seen any evidence for this so far. It is also worth mentioning the updated rear wing endplate Red Bull have been running recently. Previously, the slots that cut into the endplate within the wing’s working area have been semi-circle shaped, with the arcs of the slots facing the direction of the oncoming airflow. Now they are very reminiscent of the Ferrari slots, in that they run in parallel to the endplate and slope off towards the trailing edge. The slots are designed to minimise the pressure difference between the inside and outside of the endplate, creating more efficient downforce. They also help decrease drag, as their function is to decrease the size of the vortices that induce when the two opposing pressure meet at the wingtips. Reducing the size of these can decrease drag a substantial amount. Red Bull also introduced tweaks to their front wing. Unfortunately I do not have an image I can legally use due to copyright restrictions and Google Images has let me down. 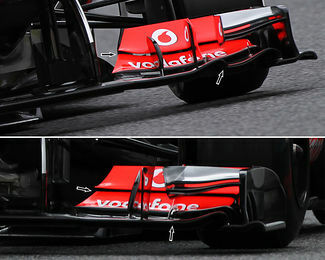 However, if you follow this link – http://www.somersf1.blogspot.co.uk/ – and scroll down to the Day 3 pictures, it shows a comparison of the front wing from the old the new version, including some modifications to the nose area. 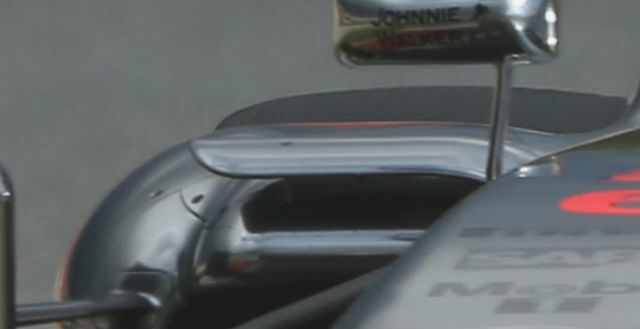 Although the above image is quite small, it shows some small modifications to the front wing of the MP4-28. The step in the mainplane to separate flow travelling to the endplate and flow being guided underneath the suspension is gone, and replaced with a smooth surface. This has been a general trend over the past year for front wings (check my blog regularly as I continue a series of posts about the evolution of the front wing since 2009 – https://thewptformula.wordpress.com/2013/02/27/the-evolution-of-the-modern-front-wing-part-1/). I suspect McLaren have found a way of separating this flow underneath the mainplane using fences. The flaps have also been simplified and now have a very straight edge to them. 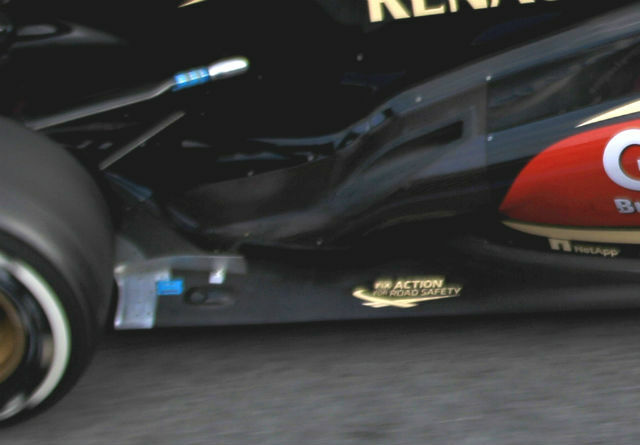 The gap between the upper and lower flaps remains constant across the whole of the wing profile, which is very different to that of the other cars across the grid. McLaren have very much their own philosophy of front wing design; whereas most teams have 5-7 element wings in all exotic shapes and sweeps, McLaren have adopted a simpler 3 tier design which utilises a large flap design to generate more downforce rather than guide the airflow more efficiently over the rest of the car. A return of the downwash aids atop of the sidepods was not a surprise and they have probably been slightly altered in shape and angle after a short absence from the car. In conjunction with the small lip at the leading edge of the sidepod, these vanes guide airflow down across the outline of the sidepod, inducing downwash upon the exhaust plume and amplifying the coanda effect to get hot air to seal off the gap between the floor and the rear tyre. Ferrari brought a substantial upgrade to Barcelona but nothing too dramatic; another evolution in their current concept. Again, I have no rights to any images and the internet is not providing me with any legal sources, so check out http://www.somersf1.blogspot.co.uk/ and look at the third picture down. Ferrari have added and additional element, making that a total of 7 tiers to their front wing with most of the slots only stretching a few centimetres from the endplates. Producing consistent airflow at the wingtips is more essential as this induces more downforce. The inboard part of the wing is mainly used for guiding flow to the rest of the car efficiently. They have also attached a new cascade winglet – a two element design split by a small curved fence as well as a small Red Bull-esque vane at the top of the endplate to help turn airflow around the front tyre. Ferrari brought new sidepods to the final test that feature a much greater downward gradient to the previous version. This is the only image I have of the sidepods but I will try to explain as much as I can. The steeper downwash should speed up the flow coming down the sidepod and generate and stronger effect on the exhaust plume, pushing it into the floor at an earlier distance from the rear tyre. We saw this when Ferrari ran flo-viz right along the rear corner of the car (again, sorry for the lack of images). The paint showed that the exhaust gases travelled inside of a small fence running in parallel with the floor that isolated the rear tyre area. The steeper sidepod gradient will enhance this effect further. Not only were they steeper, but they had small details such as additional bulges to precisely guide the downwash into the desired area of the floor and also a small dent in the exhaust channel was evident for the same reason. I have seen that Lotus ran a new front wing and a 3-piece bargeboard. Unfortunately there are no images available at all of this! Below are images of the launch versions of the two components. But here is my insight. The previous Lotus front wing had a two piece turning vane on top of the footplate of the endplate, guiding flow smoothly around the front tyre and into the wake behind. The new version has changed this in that it is now one complete piece that guides the air. Where it channels it I do not know, but perhaps the team want a larger quantity of flow to pass across another component further downstream. The 3-piece bargeboard is angled much more aggressively, turning airflow from the chassis sides much more tightly around the undercut of the sidepod. Splitting the bargeboard up into three segments will help keep the airflow attached, particularly at such an aggressive angle. Lotus were also toying between which material to use inside their exhaust channel. 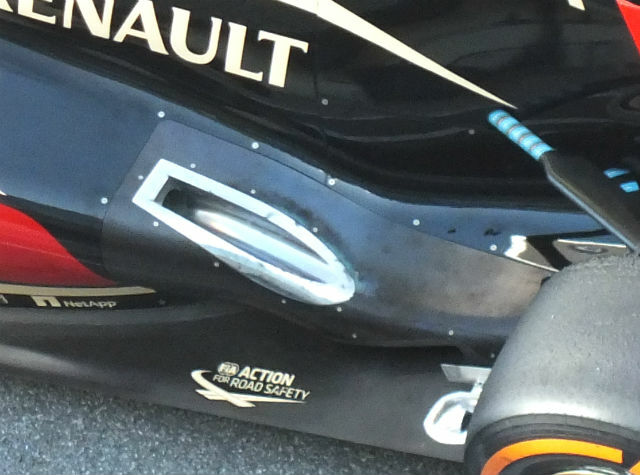 Below we can see an aluminium piece has been used to line the trough that the exhaust sits in. This is much quicker to manufacture than carbon fibre but does not give any other benefit other than that. Here is the carbon fibre channel. Renault have been having some unreliability issues with their E21 which may possibly be caused by overheating. The aluminium may be treated to withstand much higher temperatures than the carbon fibre channel but I am not really sure. It could be that Lotus are getting through a lot of the carbon fibre versions which is costing them an inexcusable amount of money, so trialling the aluminium versions will help them understand if it extracts the same performance for a smaller cost. As well as continuing to analyse their DRD, Lotus also ran the vertical fences that hang beneath the rear wing as seen on their CGI model that was available to see when the car was launched. These help expand airflow from the underside of wing quicker, rather than getting caught up in the turbulence that the tyres create. Mercedes did not introduce as many updates as they claimed they would but there were a few small details that will no doubt improve their performance. The German squad brought an ever-so-slightly modified front wing. It is hardly visible but there are very small additional winglets attached to the main 2-element cascade that helps the airflow over the suspension and inboard of the front tyre. Above is an image of the W04 at the first Barcelona test. A lot of temporary heat protection has been applied to the floor and wishbones, as overheating of the bodywork was an issue in Jerez. Below is an image from last week’s test. The heat protection around the wishbones has disappeared and although there is still some shielding along the floor, this was subsequently removed later in the week. That was a very brief summary of the top teams’ updates from Barcelona. Parts 2 and 3 will cover the midfield and chasing pack (i.e. Marussia and Caterham) teams respectively. I am very sorry about the lack of images but there isn’t much I can do! This does set back my explanations which is a shame. I will try to sort something out for my next post. Please give me some feedback in the comments section and thanks for reading! 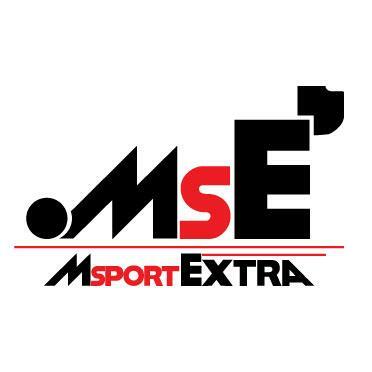 This entry was posted in 2013, Testing on March 4, 2013 by thewptformula. Very good, I can imagine finding specific images is a pain! Did the Mercedes have quite aggressive winglets and diffuser last year or is this something Mike Elliot has brought over from lotus? It’s a ‘mare, spend way too much time trying to find the best ones! It’s interesting that you say that because the Mercedes has gone a different direction in terms of the cascade winglets on the front wing. They’re very flat and only act as an airflow conditioner to guide the flow elsewhere rather than induce downforce. The diffuser is certainly very Lotus-like in that the outer fences turn away from the car very sharply, expanding the air outwards much more aggressively than some other teams, so I do see a bit of Elliot’s input in that respect. Sounds like a surprising lack of major updates for the last test. I wonder if Red Bull are hiding the effectiveness of their DRD by running high fuel so that we have no idea of telling whether their lap times are entirely due to fuel load or, partly, the effect of their DRD. D’you think any team will have a DRD race-ready for Australia? I found it quite surprising, and Adrian Newey wasn’t at the final test and was instead back at the factory. I don’t think there are fundamental problems with the Red Bull, just setup and balance issues. I doubt they will run DRD and I also doubt that teams will run DRD in Australia! If they were going to use DRD for the first round they would have used it in a race-sim during the testing period which I don’t believe anyone did. RBR have been estimated to be running at least 70kg of fuel, which alone is about 2.5s laptime. Expect them to be strong regardless of what the media say.